Dia de los Muertos is an integral holiday in Mexican and Central American culture. This yearly celebration takes place on Nov. 1 and 2 and combines indigenous and colonial beliefs. The Day of the Dead stems from the initial practice of indigenous people of South and Central America, such as the Aztec and Toltec. Before colonization, these groups believed they should celebrate rather than mourn their dead. This belief was combined with the Catholic holidays All Saints and All Souls days to create Dia de los Muertos. Although Dia de los Muertos occurs around the same time as Halloween, the two differ in meaning and in practice. As part of UNESCO’s list of Intangible Cultural Heritage of Humanity, Dia de los Muertos has its roots in indigenous culture and allows people all over Latin America to reconnect with past generations. This holiday honors the lives of deceased family and friends with activities and practices that celebrate the temporary return of these souls to the earthly realm. Ofrendas, or altars, are decorated with photos, flowers and food, and are meant to guide and welcome these spirits. Living Arts, along with several local organizations, coordinates several annual events to celebrate Dia de los Muertos and allow the Tulsa community to take part in this important event. 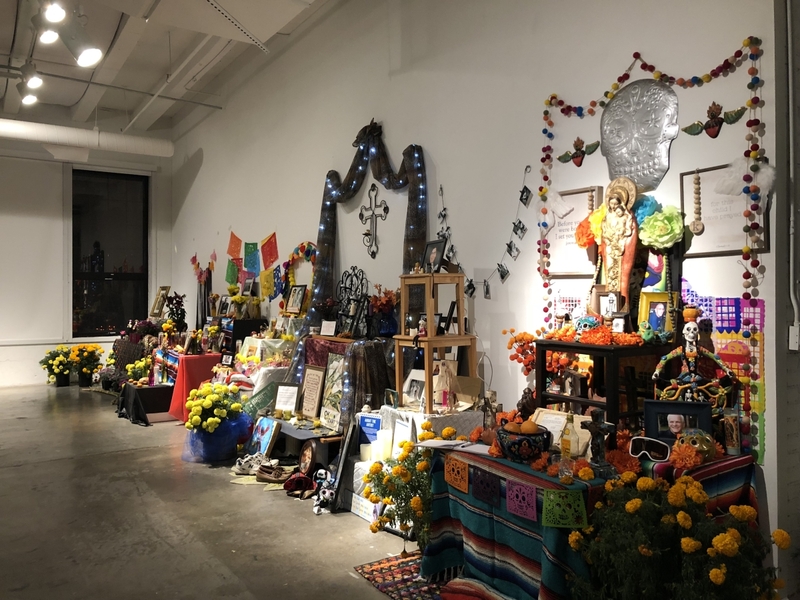 This year, it included a festival on the days of the holiday, bilingual performances of Shakespeare’s “Hamlet,” crafts, a screening of “Coco” and a panel discussion about the history of Dia de los Muertos. Hundreds of visitors attended the two-day celebration of Dia de los Muertos hosted by Living Arts. Local artists and businesses lined the streets around the gallery selling crafts like masks and jewelry to the crowd. Various food trucks and restaurants sold food from churros to tacos. For a $5 entrance fee, visitors could take part in this festival by watching musical and dancing performances organized by local performers like a ballet group and mariachi band. The interior of Living Arts was decorated with ofrendas created by local artists to honor deceased friends and family. Several other events have and will take place at Living Arts to allow Tulsans to participate in and learn about Dia de los Muertos. This included hosting a craft night on Nov. 7 called “Culture Crafts: Flores de Papel,” where participants could learn how to make flowers out of paper and take their creations home with them. Marigolds are an important part of ofrendas and these colorful paper flowers are often strung together to decorate the altars. The scent of the fresh flowers was believed to guide spirits to their ofrendas. Living Arts will also host a movie night in which guests can watch Pixar’s “Coco” on Nov. 12. Coco illustrates the Day of the Dead practices by following the story of Miguel, a young boy in Mexico. This movie exemplifies the cultural and historical significance of Dia de los Muertos as well as the beauty in its practices. Later, Living Arts will also host a roundtable discussion called “Decolonization of Death” about this holiday. Participants will take part in a facilitated discussion about how the beliefs associated with Dia de los Muertos relate to contemporary views on death. This will take place on Nov. 16 starting at 6:30 p.m.
Tulsa’s Latino Theater, Telatulsa, also organized bilingual performances of “Hamlet” that took place at Living Arts Nov. 3–11. Tara Moses, a TU alum and the director, created an evocative interpretation of this famous Shakespeare play. Moses played on the theme of the state in the original play and adapted it to represent a history of colonization. The major conflict, between Hamlet and his uncle Claudius, came to represent the conflict between indigenous and colonial powers. This conflict was manifested in several ways. The play opened with Hamlet and two women dressed in traditional Mexican skirts and faces painted like skulls placing flowers on ofrendas. Claudius, the antagonist, dressed in European clothing and always spoke English while Hamlet wore a shirt with a decorative calavera, the sugar skulls that are made during Dia de los Muertos, and switched between Spanish and English. Hamlet’s father, when returning as a ghost, only spoke in Spanish. Claudius’s killing of Hamlet became representative of colonialism destroying indigenous culture. The theme of indigenous culture was also included in key scenes throughout the play. At one point, Hamlet orchestrated a performance of indigenous song and dance complete with traditional masks. This performance is meant to guilt Claudius into admitting he had killed Hamlet’s father and in effect had stifled indigenous cultural expression by embracing colonial values instead. When Ophelia kills herself, she paints her face like a calavera and put marigolds in her hair, seeming to send the message that the only way to escape the colonial system and completely retain connection to her ancestors was in death. Ultimately, the Telatulsa adaptation of Hamlet was a timely and poignant interpretation that complimented the celebration of Dia de los Muertos and connected the themes of Hamlet to contemporary issues. Taking place surrounded by the ofrendas created by local artists, this play allows viewers to experience Dia de los Muertos in a unique and thought-provoking way.